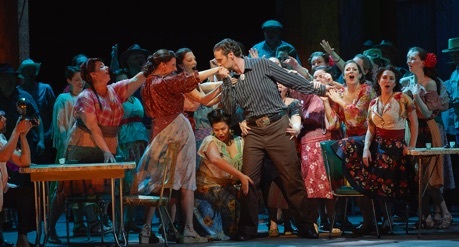 The Canadian Opera Company’s latest staging of Bizet’s Carmen is probably the best sung, best played and best directed revival of the ever-popular opera in Toronto in the past twenty years. Joel Ivany’s direction finds more in the opera than have its past two directors, the COC Orchestra sounds magnificent under conductor Paolo Carignani and the singers in the lead roles have thrilling voices. While the physical acting of the leads could be more nuanced, few will mind when they act so well with their voices. This is the COC’s third mounting of its production with sets by Michael Yeargan and costumes by François St-Aubin that relocates the action from Spain in the 1820s to Cuba in the 1950s. The production premiered in 2005 directed by Mark Lamos and was revived in 2010 directed by Justin Way. One problem with the production has always been Yeargan’s set for the first act. He divides the upstage area from the downstage area with an iron fence with a double gate. In both previous productions the directors used the downstage area as the guardhouse for soldiers and the upstage area as the public square. The problem is that both previous directors would fly the fence when there was activity on the square, like the arrival of the cigarette factory workers, and lower it again only to have performers use the gate that moments before had disappeared. For a realist opera like Carmen this made no sense. Ivany apparently realizing this, makes the downstage area the public square and the upstage are a kind of plaza between military buildings. This means he does not have to fly the fence, but it does mean that the front third of the stage gets overcrowded while the back two-thirds is underused. It is, nevertheless, the most logical solution for using Yeargan’s set. Burrage) more to do in Acts 2 and 3 to give them more individuality, so that, for a change, they are more than merely Carmen’s interchangeable companions. Ivany also makes the central conflict of the opera between freedom and duty clearer than it has been before. In her famous opening aria, Carmen has said that love is like a rebellious bird (“L’amour est un oiseau rebel”) and when Don José ties her hands he leaves a length of rope so that Carmen looks like an animal on a lead or a bird on a string. Ivany heightens the tension in Act 2 when Don José hears the bell calling him back to base while Carmen detains him and and mocks his servility. Ivany has Carmen and Don José circle each other during the final scene so that the parallel between the bullfight offstage and the murder onstage is absolutely clear. Despite her love of freedom, Carmen is like a bull raised for bullfighting, a creature born and raised for spectacle and death. Though Ivany has served as the Assistant Director for several COC productions, he is perhaps best known for the operas he has directed for his own company, Against the Grain Theatre. Its specialty has been immersive opera, like its La Bohème of 2011 played in a real pub or its Don Giovanni of 2014 staged as a wedding reception for Zerlina and Masetto with the audience sitting at tables as the guests. This side of Ivany’s direction makes an appearance in his fantastic staging of Act 4 when he places the chorus onstage in front of a graffitied wall and has the audience represent the rest of the populus. Through the audience he has a parade of vendors, the cuadrilla, chulos, banderilleros, picadores and the toreador Escamillo (Christian Van Horn) with Carmen on his arm followed by the mayor and his entourage. It is a marvellous effect and makes us complicit with the chorus who has come to see an entertainment involving death as we the audience has come to the opera to watch the death that occurs beneath the stands. The sets that audiences have seen twice before are given a very different look under Jason Hand’s lighting. The sunny plaza of Act 1, gives way to the tawdry nighttime scene of Act 2. In Act 3 he pierces the ruined chapel with very few rays of light to reflect the desperate emotions of the main characters. Act 4 is again bathed in light, though in the fateful place where Don José meets Carmen we feel the chill of the shade. When the COC last mounted Carmen in 2010, Georgian Anita Rachvelishvili was the alternate Carmen. Now she is the principal Carmen, a role she has sung and is scheduled to sing all over the world. She has an enormous, multi-hued mezzo-soprano but seldom deploys it at full force. All of Carmen’s most famous numbers, she begins sotto voce gradually rising to full voice. Rachvelishvili conveys the image of Carmen as a free spirit but not really as a femme fatale. This may be because Ivany presents her as as much a victim of fate as Don José. Carmen chooses Don José and thus ruins his life, but in choosing him she also chooses her killer. American Russell Thomas, possesses a huge Italianate tenor that will instantly remind opera-goers of the sound of the young Pavarotti. His face tends to be expressionless and he has a limited gestural vocabulary, but he does shade his voice and choke it with emotion when necessary. A greater range of expression in both singing and acting will make him unbeatable in leading tenor roles. As Escamillo, American bass-baritone Christian Van Horn joins Rachvelishvili and Thomas as the third lead with a tremendous voice and seemingly infinite lung-power. While his tone sound like it emanates from a pitch-black abyss, Van Horn’s voice is agile and expressive. He comes off as a rather more stately than glamorous Escamillo even though Ivany gives him a number of comic egocentric touches. Canadian Simone Osborne as Micaëla is the one lead who does not have a huge voice, but she does have enough lung-power and control to make herself heard clearly over the orchestra and throughout the auditorium. 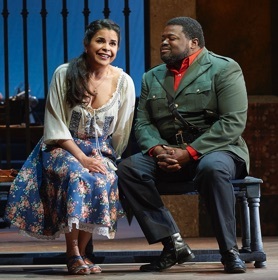 She is ideally cast as the good girl in the opera versus Carmen’s bad girl, and Osborne makes Micaëla’s aria of fearfulness and her aria pleading with Don José to return home emotionally affecting. Alain Coulombe lends his velvety voice to Zuniga yet again and displays the most nuanced acting in the cast. Sasha Djihanian and Charlotte Burrage are delightful as Frasquita and Mercédès and are effective in portraying a lightheartedness that contrasts with the increasing mental gloom that envelops Carmen. Iain MacNeil has a lovely cultured baritone as Le Dancaïre and is well matched with the light tenor of Jean-Philippe Fortier-Lazure as Le Remendado. Conductor Paolo Carignani, who lead Tosca for the COC in 2012, leads the COC Orchestra in an immensely exciting account of the score full of swirling colours and vibrant rhythms. He chooses tempi that are often on the brink of being too fast, but the orchestra plays with such precision and control that it feels as if it is showing off its virtuosity. Frequently, I felt I was listening to the Montreal Symphony Orchestra in its glory days under Charles Dutoit. This vibrant new production of the Carmen should please COC subscribers with its straightforward approach and win the company many new fans. It may be difficult to bring fresh new insights to Carmen, but that is exactly what Joel Ivany does, and now that we have seen Ivany’s staging of Act 4, we won’t want to see it done any other way. Note: On April 20, 28, May 8, 10 and 12, Clémentine Margaine sings Carmen with David Pomeroy as Don José, Zachary Nelson as Escamillo and Karine Boucher as Micaëla. On May 15 Clémentine Margaine sings Carmen with the opening night cast. The rest of the cast remain the same. 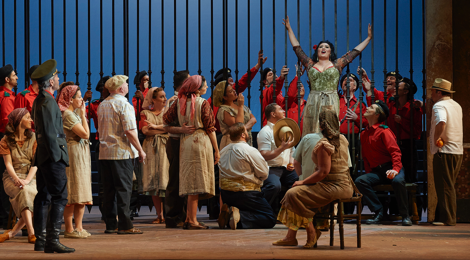 Photos: (from top) Anita Rachvelishvili as Carmen with the COC Chorus; Simone Osborne as Micaëla and Russell Thomas as Don José; Christian Van Horn as Escamillo (centre) . ©2016 Michael Cooper.